Club symbol badge. 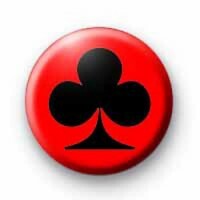 Inspired by the club symbol in a deck of cards this badge is at home both in emo circles and those who like to play poker. A rockabilly inspired button badge.